Italian restaurants ain't got nothin' on your kitchen. Rich, homemade stuffed manicotti is easier than it looks. Our video walks you through the manicotti recipe...so prepare for compliments to the chef! Spread 3/4 cup pasta sauce onto bottom of 13x9-inch baking dish sprayed with cooking spray. Mix egg, pesto sauce and cheeses until blended; spoon into resealable plastic bag. Use scissors to cut small corner from bottom of bag. 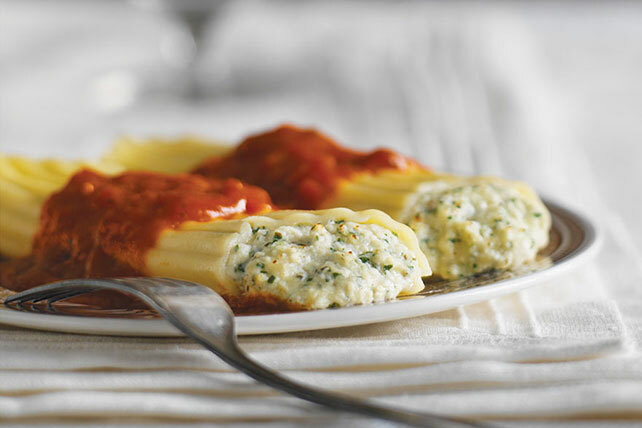 Fill manicotti shells by squeezing cheese mixture into both sides of each shell; place in prepared baking dish. Top with remaining pasta sauce; cover. Substitute BREAKSTONE'S or KNUDSEN Cottage Cheese for the ricotta and/or KRAFT 100% Grated Romano Cheese for the Parmesan. Sprinkle with a little additional grated Parmesan cheese just before serving. The manicotti shells can be cooked ahead of time. Drain, rinse and cool. Then, place in a single layer on a greased tray, cover with plastic wrap and refrigerate up to 24 hours before filling and baking as directed. If you prefer a more traditional style manicotti, simply omit the pesto.